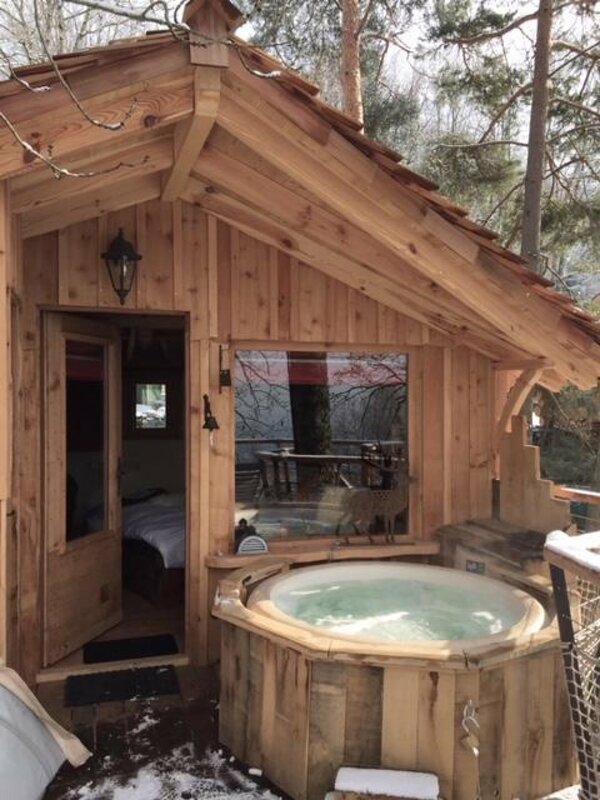 The Cabane des Pitons with a panoramic view of the Geneva Franco-Swiss basin and the Jura, it is built on a 6-metre high level and is accessed by a wooden staircase that takes you to its terrace where warm armchairs invite you to sit down for an evening under the trees and stars or enjoy its private Jacuzzi. Under the cabin a swing is available. Inside, facing the bay window, there is a large bed from which you can admire the panorama. You will also find a wood stove. The Cabane des Pitons also offers you a kitchen area , as well as a shepherd’s table and chairs. Equipped with dry toilets. In addition to the wood stove, the cabin is equipped with electric heating.